Mass Transmission Available for Pre-Order | Delos Music | Outstanding Classical Recordings for over 40 Years! Named by Musical America as the 2018 Composer of the Year as well as the most-performed composer of his generation, Grammy-winning composer Mason Bates is widely renowned for his pioneering practice of creating music for conventional performing forces enhanced by electronic sounds. 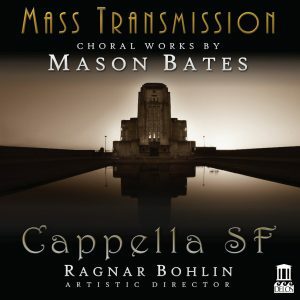 Of the two works presented in this remarkable album, Mass Transmission—in its world premiere recording—is a particularly winning example of Bates’ use of “electronica,” blended here with music for mixed choir and organ (performed by Isabelle Demers). Sirens, lacking electronica, still achieves mesmerizing vocal effects through its complex scoring for 12-part a cappella choir. Grammy-winning choirmaster Ragnar Bohlin and his superb chamber choir Cappella SF deliver astonishing performances that will not only thrill Bates’ growing legions of fans but serve as an ideal introduction to Bates’ unique electronics enhanced music for those unfamiliar with his art.